Business is booming for California’s Mad River Brewing, which aims to increase production by 300% with the installation of a new brew house. Alongside increased distribution in Colorado, Arizona, Nevada, Idaho and Alaska, Mad River’s new brew house will increase its capacity from 15,000 to 60,000 barrels annually. The brewery has also revamped its portfolio and packaging, retaining the company’s golden badge alongside scenic images representing the style and region drawn within. The concept, by designer Jason Roberson, has already been awarded gold at the Graphic Design USA 2016 American Package Design Awards. Located in Humboldt County, in Northern California. 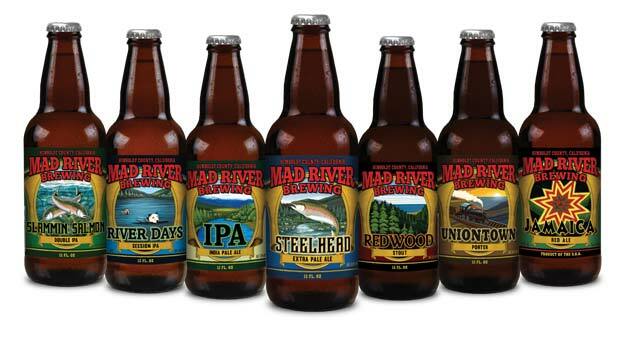 Mad River Brewing is best known for its flagship Steelhead and Jamaica brands. In 2007, Mad River was awarded its first gold medal at the Great American Beer Festival for its seasonal Barley Wine. In 2008, it won a second gold medal at the same event for its Steelhead Extra Pale Ale. Mad River Brewing is known for its green production processes, whereby it attempts to reuse all its equipment and materials. It has a reported waste reduction rate of 98%. Much of its organic waste is fed to local livestock, or is used for compost.